Journalist and critic Margaret Eby is no Southern belle—at least not in the traditional sense. With a critical eye and expansive knowledge of literature below the Mason-Dixon line, she set out to explore her heritage in her book South Toward Home: Travels in Southern Literature. In this exclusive interview, we ask Margaret what she learned, and how it’s changed her perspective. Lauren Friedlander: South Toward Home is an exploration (physically as well as philosophically) of the history of southern writing. What inspired this topic, and what inspired you to explore it in this medium? 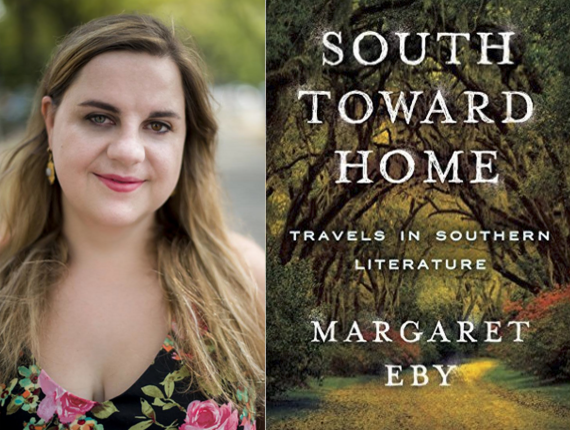 Margaret Eby: I grew up in Alabama immersed in Southern literature—I mean, we were reading Faulkner in middle school—and it took me a while to realize that this wasn’t par for the course. I had always associated the physical place with the work of those Southern literary giants like Wright and Welty. What really sparked the idea was a visit to Eudora Welty’s house, where a number of Welty devotees had reconstructed her back garden according to passages from her letters and fiction. And I started thinking about how the way we imagine places to be and how they actually appear to us are influenced so strongly by the stories we know about those places, and the people who crafted those stories. So I started visiting the sites of my favorite Southerners, to kind of piece together a personal psychogeography, which grew into South Toward Home. As a working journalist, how do you think the art of contemporary journalism has changed in the online landscape? By the time I started really working in journalism, online was already the predominant mode. It’s changed it in so many, well-documented ways, and I think there’s a general sense of pessimism about the state of journalism among journalists. But I’m not sure that it hasn’t always been a precarious, weird industry, except perhaps back in the Hearst days, but probably even then. I think one of the real benefits of the internet when it comes to journalism is it affords you a lot more space when you need it, and it gives young journalists forums for their writing that they wouldn’t necessarily have had before. In the best version of online journalism now, it also means room for more diverse voices that wouldn’t make it through the traditional news hierarchy. And that’s great. What’s the difference, in your experience, between being a woman writing on the internet vs. a man? How would the Southern female writers you explored in your book, like Flannery O’Connor and Eudora Welty, react in the Age of Thinkpieces? I would guess that every female journalist has, at one time or another, thought about what it would be like if she started going with a gender neutral or male name. I know I have. The comment sections, though they seem less a standard part of sites now than they were five years ago, are brutal, and vicious social media attacks seem to be an accepted job hazard. Welty did a lot more engagement with the journalism side of media in her time—through book reviews and essays—than O’Connor, but both were pretty removed from the daily grind of media. I think that both would be bemused. But if you look at the female Southern writers in my book, O’Connor, Welty, and Lee, all three were only afforded the opportunity to write because of circumstances not totally in their control. All of them lived with family members and didn’t marry, and they often get tarred with the spinster brush. But I think not having a commitment to a partner or children, particularly in the time they were writing, gave them more professional room than they might have had otherwise. It sure would be interesting to see what Flannery O’Connor thought about reality television, though. Who’s a writer on the rise that you’re thrilled to read more from, and who you think we should glom on to ASAP? We have such a wealth of writers these days. I keep telling people to read Claire Vaye Watkins’ Gold Fame Citrus—her essay in Tin House on pandering last year grabbed a lot of eyeballs, but I think he fiction makes her one to watch, too. What advice do you have for other aspiring writers? Alternatively, what book written by a journalist is a must-read for all aspiring journalists? In my experience, much of the writing game is about persistence. The work of writing is like 80% digging through dirt with your fingernails and 20% free champagne, and that champagne part is probably generous. I think it’s important to find joy in the work, in that digging, and not just the reception of the writing. Because the satisfaction of people retweeting your piece is fun but pretty fleeting (though obviously I’m as guilty of needing that endorphin hit as anyone else) but I’ve found the times when I’m happiest in my working life are when I’m figuring out something in my writing or reporting that seems really important to communicate to other people. One of the best pieces of writing advice I’ve gotten, and used often when I’m stuck, is to pretend that it’s an email you’re writing to a smart friend. And the books, oh the books. Everyone needs to read The Journalist and the Murderer by Janet Malcolm, which is fascinating and vital. Acquaint yourself with Martha Gellhorn and Ellen Willis and the people working today whose stories you admire. Look at bylines. Find the people whose work makes you feel like things are possible, and read everything by them. And keep going.